Facebook practically created the casual gaming boom that began with hyper-addictive games like FarmVille. However, the world’s largest social network increasingly seems to be happy to avoid a second-coming for casual gaming on mobile in favor of being a platform for others. The company introduced its App Center in May, which is available on mobile and desktop, and this week it tweaked the games section to help users discover games more easily from any device. Facebook’s support practically turned Zynga into the company that it is today. Now, with Asia-based messaging companies like Line and WeChat raking in the money from dedicated gaming platforms that license third-party titles, Facebook must be tempted to jump in again, this time on mobile? Line has nearly 500 million registered users and it is on track to pull in nearly $600 million in revenue for the year going on its most recent quarter — and that’s excluding its phenomenal 223 percent annual and 19 percent quarterly growth. WeChat has 390 million monthly active users, but its gaming platform revenue has not been disclosed. The chat app helped triple parent company Tencent’s mobile game revenues to $290 million in its latest quarter of business, though. These chat app gaming platforms are essentially mobile-optimized versions of Facebook in its gaming heyday. Users download standalone apps from Google Play or the App Store and then link them up to their messaging accounts. That allows Line and WeChat to tap into the friend graph to let users compete on friend-based leaderboards, share messages and games in exchange for free items, and take advantage of other such viral mechanisms. The games are offered for free and the companies make their money from in-app purchases. Line offers more than 30 different games. Titles on its games platform have garnered more than 300 million cumulative downloads — more than seven of them have been downloaded over 10 million times. Tencent is less vocal about WeChat’s game data, but we do know that the first five games for the Chinese version of the app — Weixin — hit 570 million downloads in their opening three months. 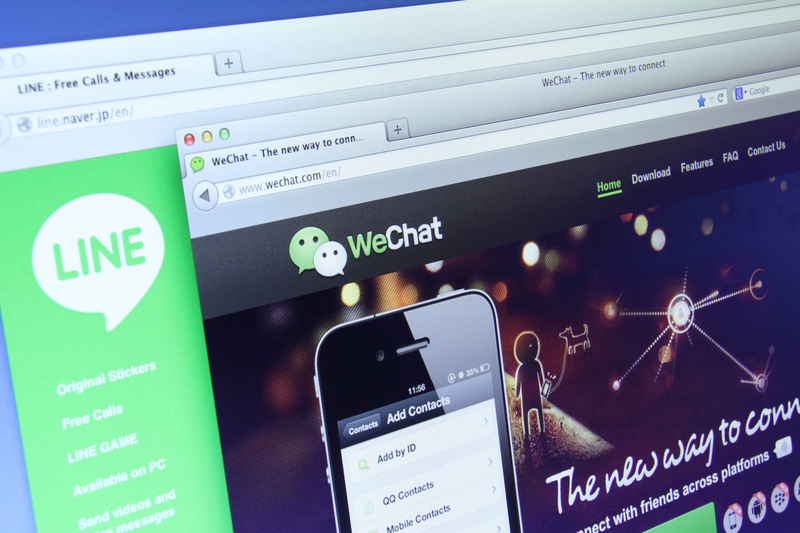 WeChat is truly disrupting China’s mobile gaming space. Kakao in Korea is far smaller than WeChat or Line but it is also going great guns on gaming. It dominates the local app store listings and games helped it turn in a $59 million annual profit — impressive for a four-year-old company. Games are clearly where the money is at. With Kik and Tango the only two US-headquartered messaging firms with a gaming strategy, it is early days in the American market; that could suit Facebook. I wrote back in April that I believe Facebook has a two-pronged strategy for mobile messaging: keep WhatsApp as the simple SMS replacement, and build Messenger into a more content-driven experience. Though I said Facebook Messenger could adopt its own gaming platform in the future, it seems for now that Facebook is happy to play enabler rather than offering its own gaming platform. Revenue from mobile accounted for 60 percent of Facebook’s total ad revenue during the last quarter, and its mobile app ad install system is blazing a path that Twitter and others are keen to follow. As it stands, this method keeps Facebook agnostic and serving its advertisers by delivering them attention. Were it to open a gaming channel, it would immediate compete with the very companies that are buying its app ad installs so keenly. 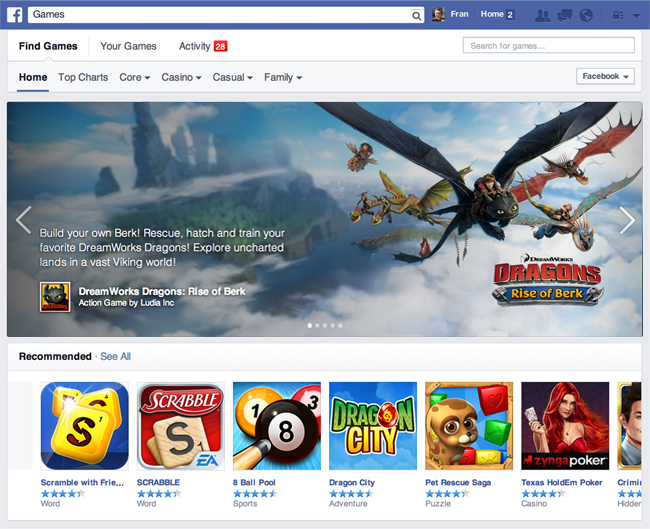 Facebook Games could compromise users as well as advertisers too. The company may have learned its lesson from the days of FarmVille, when friend requests to buy cattle and other such spam adorned the walls of millions of Facebook users, causing irritation and frustration to many who began to question to the value of the social network. The experience on mobile is far more personal, each unsolicited message is more painful than on a desktop, so keeping a experience free from spam is essential. Facebook looks to be aiming to go far higher than merely gaming on mobile. It has plans for payments and other platform-like services, but it may need to revaluate its thinking and making gaming a priority if Line, WeChat or another messaging app can position itself well in the US and steal attention away from Facebook. Certainly, these are some of the world’s top technology companies, and they are aggressively pursuing gaming to help them in their quest to expand globally. Tencent recently forked out $500 million for a stake in Korea’s CJ Games. We’ve heard from sources that it is making a huge push to woo studios in the US, and the company recently said it is looking to go beyond casual gaming with a focus on mid-core titles. Alibaba is starting from scratch but its deep pockets and presence in the US via a recent investment in Tango could also pose a threat to attention for Messenger. Mobile games-focused social networks like DeNA and GREE may have failed to expand their empires out of Japan, but messaging apps are the hot topic of 2014 and gaming is a key way to engage users and make large amounts of money – just don’t expect Facebook to be directly involved in the space. Note: This post previously said erroneously that Facebook’s mobile app ad install system accounted for nearly 60 percent of its total ad revenue during the last quarter. This has been corrected above.